Oil on canvas, 49 x 65,5 cm. 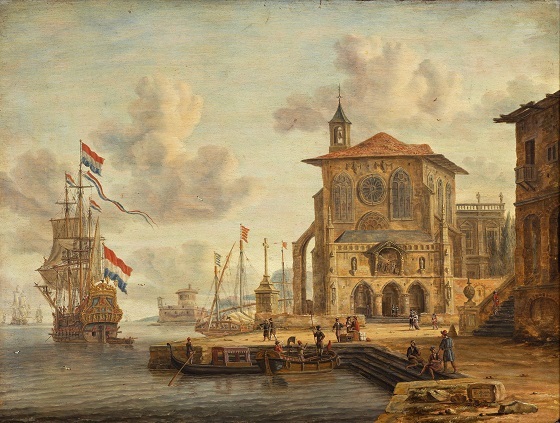 Abraham Stork specialised in painting Mediterranean harbour scenes in which architectural elements, depicted according to the artist’s own imagination (capriccio), were combined with depictions of the Dutch merchant marine. The artist often sought inspiration from famous Venetian buildings, which he rearranged and used as picturesque backgrounds for his staffage and merchant vessels. In this marine painting, a Dutch merchant ship is about to leave the harbour while visiting merchants and locals look on. The calm composition is bathed in a golden Mediterranean light, which both highlights the architectural forms of the buildings and adds to the atmospheric mood.